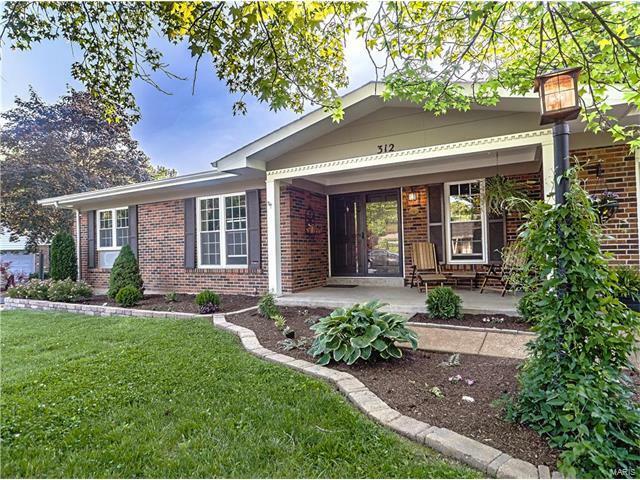 Lovely Predominately Brick Ranch with Beautiful Curb Appeal. The Charming Covered Front Porch Will Lead You to the Inviting Entry Which is Open to the Living Room/Den & Separate Formal Dining Room with Crown and Dental Molding. Then on to the Spacious Family Room Which Offers a Woodburning Fireplace & French Doors Leading to the Deck Overlooking the Private Picturesque Yard. The Kitchen Boasts Stunning White Cabinets with Crown Molding, Breakfast Bar, Granite Counters, Gas Cooktop, Double Oven, Skylight, Hardwood Floors & French Doors that Open to the Amazing 3 Seasons Room with Tile Floor, Ceiling Fan & Surrounded by Windows. The Master Bedroom Suite has Crown Molding & Updated Bath. There is Even More Space in the Finished Lower Level with Rec/Family Area, Updated Full Bath, Possible 4th Bedroom with Walk in Closet & French Doors Leading to Private Office. There is Still Lots of Storage Space in the Unfinished Area. Hurry and See All This Beautiful Home has to Offer.